« Cliché‎ Knight texture? Put it on Luigi. It was posted on June 5, 2013 at 03:15. There's 8 Comments and it's in libertyernie and Programming. 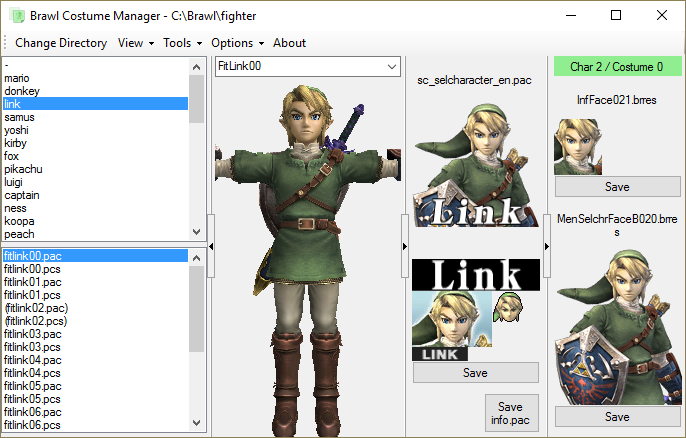 Brawl Costume Manager is a .NET application for managing the costume files and corresponding CSS (character select screen) portraits for each character in Super Smash Bros. Brawl. If a .pac or .pcs file exists, this program can display the model(s) in it. If a common5 or sc_selcharacter exists, it can display the appropriate CSS portrait. If the right file is in char_bust_tex, it can show that portrait too. You can replace all of those with drag-and-drop. When you copy a .pac or .pcs file, it makes the other file (.pcs or .pac) automatically! This program uses the same BrawlLib as BrawlBox v0.68c. libertyernie wrote it. Don't look at me. I fixed some bugs now, so try it again. Any chance of getting this to work on mac? Being able to change battle portraits without individually opening them all would be incredibly convenient! Hello, I am having a problem. Whenever I open this version of the Costume Manager, it says it ha stopped working. I am using windows 8 by the way. Do you know what the error seems to be? Is this program able to add additional costumes, or simply replace preexisting ones? I’m trying to add a costume to my copy of Project M, it’ll allow the pac files, but not any images to correspond.